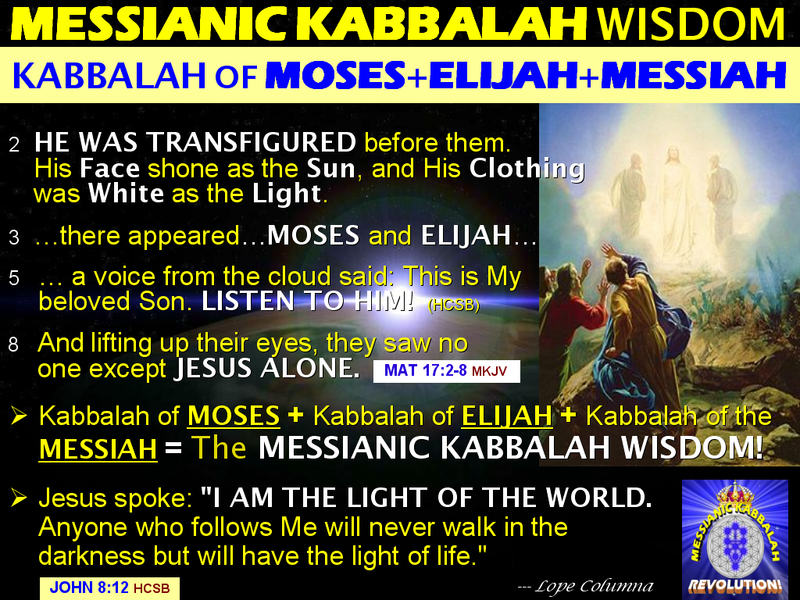 All the supernal Messianic Kabbalah Revelations reveals the Secret of LOPE COLUMNA. That is, when he received God's End-Time Revelation of MESSIANIC KABBALAH WISDOM from Heaven; then Mankind's GIANT LEAP TO IMMORTALITY started (Isaiah 46:11). This will come to completion and fruition at the actual Glorious Return of the Personage of the KING of Kings and LORD of Lords => Christ Jesus from Heaven to Earth (1Corinthians 15:51-54)! 1. The word LOPE, which means GIANT LEAP, is the cleansing and elevation of Man's Mindset from Earthly thoughts to Heavenly Thoughts (Isaiah 55:7-9, Colossians 3:1-2). In the Human Body, this corresponds to Paradigm Shift from the Cerebellum to Cerebrum. 2. 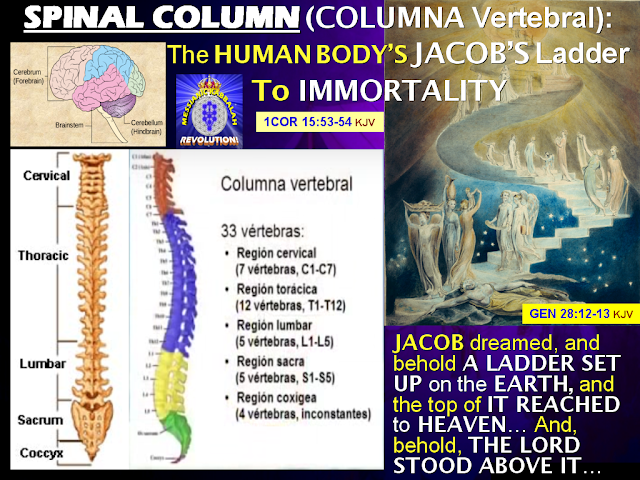 The Path upward to HEAVEN (corresponds to the CEREBRUM in the ForeHead) is via the COLUMNA VERTEBRAL, which corresponds to Jacob's Ladder leading to HEAVEN where The LORD God is (Genesis 28:12-13). Every Human Being has that sacred CHRISTOS OIL => The "CHRIST IN YOU" that became a Mystery when it fell to the SACRUM of the Spinal Column due to the SINS of Mankind (Colossians 1:27). This CHRISTOS OIL must be elevated and restored to the CEREBRUM via the COLUMNA VERTEBRAL (Spinal Column). 3. After 3 Days that the CHRISTOS OIL reaches the CEREBRUM (Forehead), then one is quickened to IMMORTALITY by the Everlasting Covenant God gave to Israel. In other words, that Person is transformed from Mortal to Immortal by the Power of the 144,000 from the 12 Tribes of Israel (Psalms 105:8-10). For an in-depth explanation, go to: The Secret Of 144,000 From The 12 Tribes of Israel, Now, Revealed! This 144,000 Is Not Only For Israel, But Also For The Gentiles. The 144,000 Is The Powerful Number in The Process Used To Prepare & Make Ready Jews & Gentiles For TRANSFIGURATION (RAPTURE). All these supernal Messianic Kabbalah Revelations reveals the Secret of LOPE COLUMNA. That is, when he received God's End-Time Revelation of MESSIANIC KABBALAH WISDOM from Heaven; then Mankind's GIANT LEAP TO IMMORTALITY started (Isaiah 46:11). This will come to completion and fruition at the actual Glorious Return of the Personage of the KING of Kings and LORD of Lords => Christ Jesus from Heaven to Earth (1Corinthians 15:51-54)! ONLY GOD'S MESSIANIC KABBALAH WISDOM GIVEN TO LOPE COLUMNA CAN "RAPTURE" AND MAKES YOU A PILLAR OF THE KABBALISTIC KINGDOM OF GOD! In the First Century A.D., Peter, James, and John were made PILLARS of the Church because they were chosen by Christ to witness the development of God's MESSIANIC KABBALAH WISDOM, which is the secret of Christ's TRANSFIGURATION (Matthew 17:1-2, Galatians 2:9). In the 21st Century End-Time, the upcoming TRANSFIGURATION of Christians and Jews at the Glorious Return of Christ is called "RAPTURE." This can be achieved only via the Power of God's MESSIANIC KABBALAH WISDOM God gave to LOPE COLUMNA (1Thessalonians 4:16, 1Corinthians 15:51-54). For additional explanations, go to: GOD'S MESSIANIC KABBALAH WISDOM MAKES YOU A PILLAR OF THE KABBALISTIC TEMPLE OF GOD => The NEW JERUSALEM!